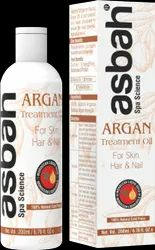 Providing you the best range of asbah argan treatment oil with effective & timely delivery. Asbah's 100 percent Natural Argan Oil is cold-pressed and never processed to ensure the most powerful, highest-grade oil. Soften, Strengthen, Moisturise & Protect. 100% natural Argania Spinosa (Argan) Kernel Oil. Dry Hair : Apply a small amount from mid-length to ends, to help smooth and eliminate frizz and help protect against environmental factors, including the sun and wind. For Under Eye Area : Use to intensely hydrate and reduce the appearance of fine lines. For Nails : Use to condition cuticles.